For knitters, one of the staggering things about the streets of Reykjavik is that they are so full of people wearing handknits that you almost stop noticing. The lopapeysa is everywhere. What's more, it's on everyone. The hip and the dowdy, the young and the old, the ample and the spindly all hike about with the signature patterned yoke around their shoulders. On day one, spotting them was sport enough. "Over there," Stephen would hiss in my ear, "by the coffee shop." Mike would snap a surreptitious picture with his iPad, if a photo taken by waving a large, flashy piece of electronic equipment in the air can be said to be surreptitious. By the end of the trip, we had moved along from mere sighting to identifying according to which Lopi book they'd been published in. "Number 26," I'd say, casually nodding my head in the direction of a passing specimen. "That's four this morning," Stephen would note. Stephen is good at counting things. Mike would snap a surreptitious picture with his iPad, if a photo taken by waving a large, flashy piece of electronic equipment in the air can be said to be surreptitious. 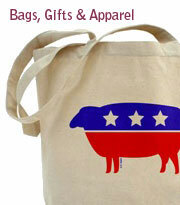 You can attribute the universal popularity of the lopapeysa to many things. It's warm. It's handsome. It's durable. You can buy the yarn for it at the grocery store for thirty bucks. and I'm having trouble setting it aside so that I can eat, sleep, bathe, engage in human contact. Knit on, Franklin! I wouldn't be able to put it down, either. My fingers are twitching. . . I'm loving your color choices. Oh my, I want your resources and knitting skills. Those colors are gorgeous together. Absolutely amazing. Sad cowboy. 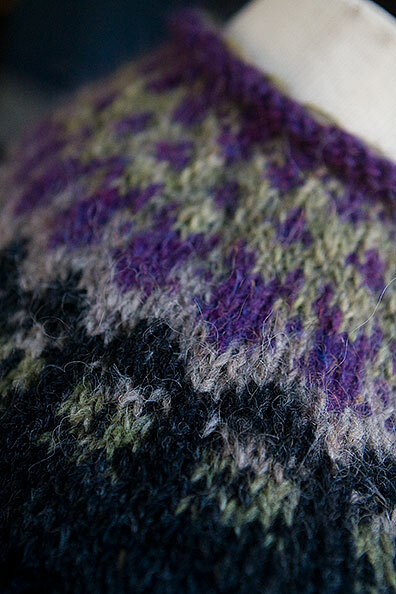 Could we please have an Icelandic knitting festival and call it lopapeysapalooza? I just LOVE those colours... a very unusual but a really beautiful combination! The colors are wonderful. Hurry up I want to see it finished. That's gorgeous. And you make me want to run upstairs and start putting together a colorwork project RIGHT NOW and to hell with getting the house ready for the appraiser. How clever of you to have found a dress form that fits in your suitcase. I wish I had one. Great colors. You are inspiring. 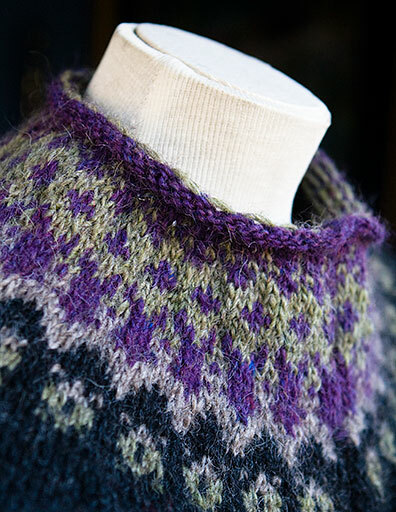 All of a sudden, I want to chuck my current project and find an icelandic sweater to knit from the top down! Lord knows I got the yarn! my goodness, that is so lovely! And the colors are really delicious. Love it! It looks great Franklin....I wouldn't be surprised if we don't hear from you again until it is completed. The question is, will the next one already be cast on? You have super human willpower - Then again, I probably would have been on a bender with Dolores by now because color working gives me fits... lol. That is one. luscious. yoke. About 3 decades ago I knit 3 in about 6 months. 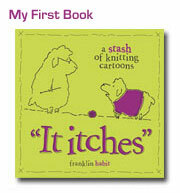 Now you have me itching to knit another...yours is fabulous. Beautiful. Loving the way your colours are positively "singing" together. BTW my word verification for this comment is "moestria" which I'm seeing as "maestro". Lol! $60?! Um, sweetie, I paid about $26 for my yarn at the Álafoss store. And that's not counting the kilo plus of plötulopi that's still waiting for me to suss out exactly how I want to knit it up. Or the lovely buttons I got. You're right, Mel. Not 60, but 30. I misread my receipt when I was putting my post together and added in a bunch of Einband that I bought at the same time. You know more about Iceland than I can ever possibly hope to. Mea culpa. I can't stand it. $30 for wool for a man's sweater? Really, in Connecticut you could hardly make a child's sweater for that. Much knashing of teeth. The colors are perfection indeed. Love them! I love knitting the yoke part of these sweaters, but the plain part at the bottom sort of bores me. Having finished the yoke, you are now at the part of the sweater where you can knit in the movies. The Three Musketeers is good. I feel like the characters in the TV show Lost. "We have to go back to the island!" I fear for the first person I encounter on the street wearing a sweater. I could jump them, pin their shoulders down with my knees and yell, "LOPAPEYSA!" while shedding tears of recognition. Beautiful! I love the color choices you changed. This looks amazing and I wouldn't be able to stop either. I already have plans that my next steeked sweater (because I prefer cardigans) will use a non-superwash wool, so I can have it even easier by not needing to machine sew it together. Oh that's pretty! I can see how that could be addictive. I do 4 to 7 yoked sweaters a year (depending on who I get for Christmas). People (well, my mother and my children) start requesting them for next Christmas the previous Jan. This year my mother said "I'd like a tan cardigan" and my 11 year old said "I want one for the ski race in Jan so everyone can see me!" My husband says "Nothing too bright"... They are addictive. I can see how it would be addictive. What beautiful colors..just keep knitting, we can't wait to see it finished! Now that I have an iPhone, I will be *slightly* less obvious with the photo taking. Slightly. Your lopapeysa yoke? STUNNING!!! I can't wait to start mine. I looked for the wool section at the Berkeley Bowl last night and I couldn't find it. Packing for Iceland toot sweet. Hence the old saying, "...one more row!" I used to knit Lopi sweaters on commission in the early 80s. Most of my customers were young Navy officers who would get shipped off to Adak, Alaska every 18 months or so for a 6-month tour. They all claimed that the sweaters were warmer than their Navy-issued parkas. I could churn a custom-fitted one out in two weeks. I thought I was a fast knitter until my best friend reminded me that I was using "big yarn on big needles." She really took the wind out of my sails with that! You're just so darned cute...Can I adopt you as my 3rd son? Then you can knit for me, too! Tom, Harry &/or Dolores: You may have to hold a Victorian knitting pattern in front of Franklin to bring him back to consciousness. Franklin: I hate to tell you this, but your Adorable Niece (TM) Abigail is going to "permanently borrow" that sweater someday. She won't be able to resist those colors. I know my nieces couldn't! love what youve done with the yoke. cant you have someone else do all the other things for you? at least until youve published the pattern for this one here? you made me laugh. Please, eat! I daresay you aren't going to read this comment since you'll be too busy with charts to look at a computer screen (and I can't blame you), but the colors you chose are really, really lovely. When you first posted the picture of the black and white Vetur from Lopi 28 I thought "What? Really?" But now I see: purple and more. Ooh. One year I made all the fathers in the family Lopis, and all of their children Lopis for a total of 12 sweaters, I was knitting in the round walking around town. It was wild on Christmas morning. I just learned "Two hands, two colors" this weekend with Sally Melville and am dying to try my first project. I have the yarn set aside at home to begin this evening. I am scared I will be addicted also. Your posts have made me start craving yoke sweaters.. I've never knit one before and I'm searching for a decent top-down pattern. Thanks for launching a new obsession! Remarkable work, Mr. Habit! Pretty Aryan Boy in the previous post won't stand a chance when you are photographed in all your wooly splendor. Gorgeous! I love the colors you picked, too. Can't wait to see the final product! Love, love, love the color choices... I want one!!! Ooooo, Franklin it's so absolutely beautiful! I'm sure you will look fabulous in it! Grrr. You have made me want to knit a Lopi sweater for myself, and I just KNOW that it make me look matronly. Okay, Franklin. How many of those things have you knit by now? Are you ready to come up for air yet? We miss you. . .
Günümüzde kırışıklık kremi konusu birçok insanın zihnini meşgul etmektedir çünkü birçok insanın kırışıklık problemi vardır. Kırışıklıktan kurtulmak için kırışıklık kremi gibi birçok cilt kremleri ve leke giderici krem piyasada satılmaktadır. Peki kırışıklık tedavisi için bunlardan hangisini kullanmalıyız? Bunlar cildimize zarar verir mi ya da yan etkileri nelerdir? Etkili kırışıklık kremi hangisidir? Kırışıklık tedavisi sözkonusu olunca bunun gibi birçok soru insanın aklına geliyor. Belki bunların cevabını araştırmadan önce kırışıklık nedenleri konusunda araştırma yapmalıyız.